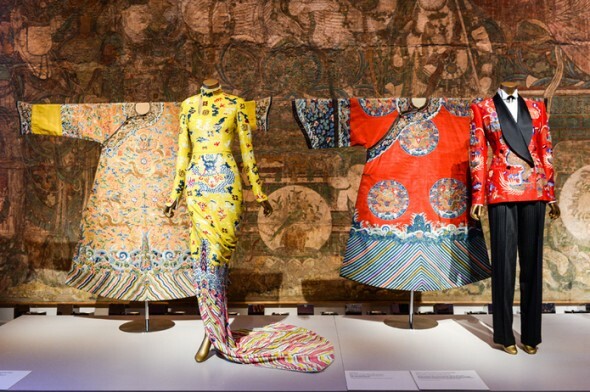 The Costume Institute’s spring 2015 exhibition, China: Through the Looking Glass, will be on view at The Metropolitan Museum of Art from May 7 through August 16, 2015. 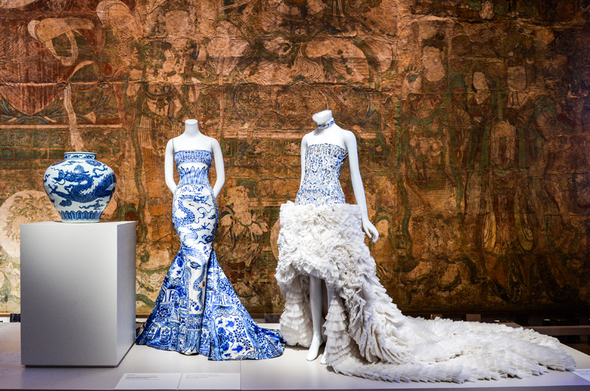 In this collaboration between The Costume Institute and the Department of Asian Art, the exhibition will explore the impact of Chinese aesthetics on Western fashion and how China has fueled the fashionable and cinematic imagination for centuries. “I am excited about this partnership between these two forward-thinking departments which will undoubtedly reveal provocative new insights into the West’s fascination with China,” said Thomas P. Campbell, Director and CEO of the Met. This is The Costume Institute’s first collaboration with another curatorial department since AngloMania: Tradition and Transgression in British Fashion in 2006, a partnership with the Department of European Sculpture and Decorative Arts. China: Through the Looking Glass will feature more than 140 examples of haute couture and avant-garde ready-to-wear alongside masterpieces of Chinese art. Filmic representations of China will be incorporated throughout to reveal how our visions of China are shaped by narratives that draw upon popular culture, and to recognize the importance of cinema as a medium through which we understand the richness of Chinese history. The Anna Wintour Costume Center’s Lizzie and Jonathan Tisch Gallery will present a series of “mirrored reflections” focusing on Imperial China; the Republic of China, especially Shanghai in the 1920s, 1930s and 1940s; and the People’s Republic of China. These reflections, as well as others in the exhibition, will be illustrated with scenes from films by such groundbreaking Chinese directors as Zhang Yimou, Chen Kaige, Ang Lee, and Wong Kar Wai. Directly above the Anna Wintour Costume Center, the Chinese Galleries on the second floor will showcase fashion from the 1700s to the present. Designers in the exhibition will include Cristobal Balenciaga, Travis Banton, Bulgari, Sarah Burton for Alexander McQueen, Callot Soeurs, Cartier, Roberto Cavalli, Coco Chanel, Christian Dior, Tom Ford for Yves Saint Laurent, John Galliano for Christian Dior, Jean Paul Gaultier, Valentino Garavani, Maria Grazia Chiuri and Pierpaolo Picciolo for Valentino, Craig Green, Guo Pei, Marc Jacobs for Louis Vuitton, Karl Lagerfeld for Chanel, Jeanne Lanvin, Ralph Lauren, Christian Louboutin, Martin Margiela, Alexander McQueen, Alexander McQueen for Givenchy, Edward Molyneux, Kate and Laura Mulleavy, Dries van Noten, Jean Patou, Paul Poiret, Yves Saint Laurent, Paul Smith, Van Cleef & Arpels, Vivienne Tam, Giambattista Valli, Vivienne Westwood, Jason Wu, and Laurence Xu.